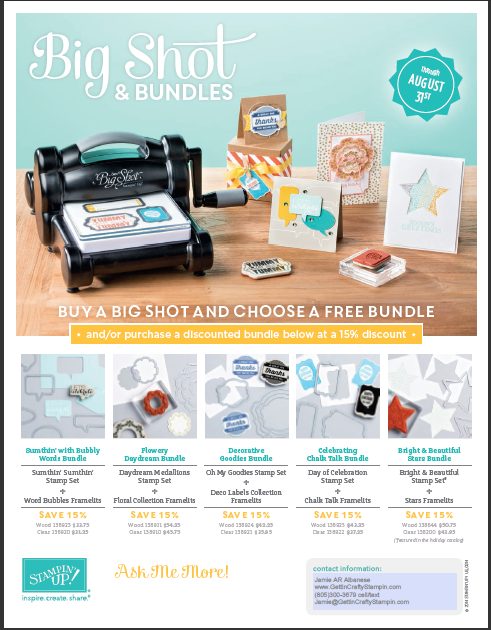 Getting Crafty with Jamie: Big Shot with FREE Bundles and MORE!! Big Shot with FREE Bundles and MORE!! If you've been waiting for the right time to purchase a Big Shot, that time is August! 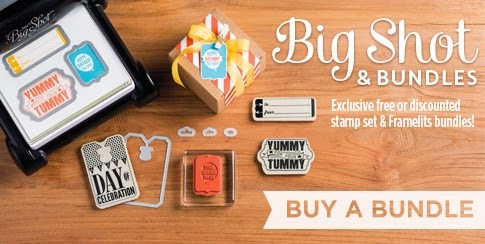 When you buy a Big Shot during the month of August, you'll receive your choice of one of five FREE exclusive stamp set and Framelits bundles -- that's up to a $55 US value absolutely free! If you already own a Big Shot, we're also offering a 15-percent discount on these select bundles. EVERY Crafter NEEDS this amazing tool! I have MANY Video Tutorials on this awesome tool and cool uses! (See the Basic Video then sign up for my YouTube Channel for FREE Tutorials!!). BONUS!! YES - Of COURSE I will sweeten the Deal!! ~ Come to the Big Shot Highlight (Texture and Die-Cutting WOW Techniques) Crafternoon (Saturday, Aug 26 - 1:30-3:30pm) - FOR FREE!! YES - Score a FREE Class that will Highlight the USE of this Big Shot!! ~~ MORE?? Heck Yeah!! I will Send ALL Who Place an Order With ME for a Big Shot (with all the other bonuses) a FREE Video WOW Highlight Reel! I will send YOU a collection of WOW Techniques in Video Format that will take your projects to the next level!! YAY!! Use THIS (URF72DA6 ) Hostess Code, at check out, and receive a BONUS Gift from ME!! If you're anything like me, you absolutely love when BIG opportunities come your way. And because we all know the Big Shot is a big deal, we thought we'd offer you something you couldn't miss; an exclusive Big Shot opportunity that lasts for the entire month of August! We want to help put a Big Shot into the hands of every crafter before the holiday catalog -full of sweet Big Shot accessories-is available!! That's why with every purchase of a Big Shot in August, you can receive one of five free stamp set/framelits bundles below, their choice! Not only that, but if you already own a Big Shot, they can still purchase these designated bundles at an amazing 15% off! This is one deal you won't want to miss-only available from August 1-31-as these bundles are one-time only exclusives. ~ Book YOUR Private Class with ME and Schedule YOUR DATE NOW for August and you can earn HOSTESS Dollars, Buy Your BIG SHOT and Receive the BONUS Bundle for FREE and Discounts on All of the remaining Bundles - before they are available!! ~ Join MY TEAM (NOW): Yes - Secure the Big Shot with your Demonstrator Discount, Receive the BONUS $60 Bundles and KICK START Your Crafting Business!! With Your First Order Giving you an immediate 30% Discount You Will SCORE! 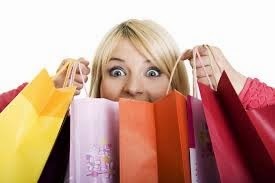 Let ME Show YOU how to get the most for your dollar, Kick Start Your Crafting Business and MORE!! So how can I help YOU to get the most for your dollar? Dates for a Private Class are LIMITED - Book One NOW! Let ME Help YOU to Score with Exclusive Bonus Tutorial Videos (Emailed Directly to YOU - you can go back over and over to refresh your how-to's), Free BONUS Crafternoon Big Shot Highlight Class and the FREE Bonus Bundle, 15% off the others... WOW!! Use THIS (URF72DA6 ) Hostess Code, at check out, and receive a BONUS Gift from ME!! Call Me (805)300-3679 or email me at Jamie@GettinCraftyStampin.com to Book a Private Class, Join My Team and To Secure YOUR Big Shot and Bonuses NOW!! Time is LIMITED.